This guide is intended to provide a comprehensive description of the encounter with Kilrogg Deadeye in Hellfire Citadel. It is targeted at anyone who desires to understand the fight mechanics. This guide is updated for World of Warcraft WoD 6.2. 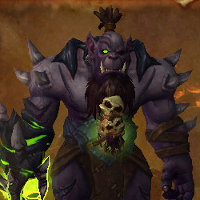 Kilrogg Deadeye is a boss encounter in the Hellfire Citadel raid instance. To succeed in this fight, your raid will have to have good add control and correct positioning. This guide is written and maintained by Azortharion, a top Hunter with 6 years of raiding experience, who currently raids in Ðanish Terrace, a world top 20 guild. For the Looking for Raid version of the fight, we provide you with a special LFR guide. This will tell you everything you need to know in order to complete the encounter, in a quick and concise way. We do not currently know what the hard enrage timer for this encounter is. Kilrogg Deadeye is a single-phase encounter where your raid must fight Kilrogg himself, as well as a number of adds that spawn frequently. In order to defeat the encounter, your raid must kill Kilrogg without getting overwhelmed by the adds. If the adds are not killed in a timely manner throughout the fight, it will lead to a wipe. Additionally, there is a special realm (the Death Realm) that several raid members may enter at once, by standing inside a frontal cone ability that Kilrogg occasionally uses. The objective within this realm is to kill enemies and survive as long as possible, in order to gain two damage/healing buffs that may be used outside of the realm. When Kilrogg Deadeye dies, the encounter is over, and your raid has succeeded. Perform a tank switch on Hulking Terrors when the Fel Corruption applied by them builds to uncomfortable levels. Keep in mind that Fel Corruption is not a traditionally stacking debuff. Face Hulking Terrors away from the raid, due to Savage Strikes. Perform a tank switch on Kilrogg when one stack of Shredded Armor is reached. Keep in mind that with good active mitigation usage, this should never happen. When exiting the Death Realm with Cleansing Aura, identify and stand near raid members with high Fel Corruption. On Mythic mode, beware of the damage that players affected by the Heart Seeker DoT take, since this DoT lasts until the end of the fight. On Mythic mode, the Fel Blood Globules are the top kill priority, and Hulking Terrors should not die shortly before a Death Throes cast. Run far away from Kilrogg when targeted by Heart Seeker, to place Blood Globule adds as far away as possible. Avoid standing in Death Throes by constantly running when it is being cast. Stand far away from Kilrogg when he casts Death Throes, to reduce damage taken from it. Interrupt the Hulking Terrors' Rending Howl. Never reach 100 Fel Corruption. Avoid standing in front of Hellblaze Mistresses. Stand at a distance from Hellblaze Fiends when they die and avoid standing in the void zones they leave behind. On Mythic mode, players with low Fel Corruption must soak Fel Puddle void zones left behind by Hulking Terrors before Death Throes is cast. When the encounter begins, your raid must contend with the first round of adds that spawn, as well as with Kilrogg Deadeye himself. Throughout the rest of the fight, waves of adds spawn roughly every 45 seconds. Additionally, one of Kilrogg's main abilities will spawn an add every time it is used. Before going into the abilities used by specific mobs, we need to explain the Fel Corruption ability. This is a passive aura that is active from very early into the fight (from the moment that the first Hulking Terror add spawns) until the end of the fight. Fel Corruption acts as a resource, with a maximum capacity of 100. Each raid member can track their own Fel Corruption level using the alternate power bar provided in-game. Several abilities throughout the fight cause players to gain Fel Corruption, and one ability allows raid members to reduce their Fel Corruption. Additionally, Fel Corruption decays slowly over time if no Hulking Terror adds are alive. Fel Corruption has two effects. Firstly, it deals Fire damage every second to all raid members, with the amount of damage dealt depending on the level of Fel Corruption. Secondly, if any raid member reaches 100 Fel Corruption, they instantly become permanently mind controlled. Shred Armor is an ability that Kilrogg Deadeye regularly uses on his current tank. This applies the Shredded Armor debuff. Shredded Armor is a stacking debuff that increases the tank's damage taken from all sources by 40%. This debuff is not applied to tanks who have an active mitigation cooldown in effect at the time when Shred Armor is used. This ability requires a tank switch, if a tank fails to use their active mitigation and they are affected by it. Heart Seeker is a targeted ability that Kilrogg regularly uses throughout the fight. He picks a random raid member, and after 5 seconds, he inflicts heavy Physical damage to that player. Any raid members standing between Kilrogg and the targeted player take the same damage. Additionally, it applies a 30-second Physical damage DoT to everyone it hits. When the targeted raid member is hit by the Heart Seeker, a pool of Blood Splatter spawns beneath them. Blood Splatter is a void zone that deals moderate Shadow damage every second to players standing in it. However, Blood Splatters are extremely short-lived, since as soon as they appear, they spawn a Blood Globule or a Fel Blood Globule and disappear afterwards. Blood Globules are adds with relatively low health that can be crowd controlled, but not tanked. As soon as they spawn, they move towards Kilrogg. If they reach him, the entire raid takes massive Shadow damage. Fel Blood Globules spawn when the player targeted by Heart Seeker has any Fel Corruption. They act just like Blood Globules, but they deal more damage when they reach Kilrogg, and they also heal him for 15% of his maximum health. Death Throes is an ability that Kilrogg occasionally uses throughout the fight. He deals heavy Fire damage to everyone in the raid every 2 seconds for 6 seconds, with the damage being lower the further away the raid stands from Kilrogg. Additionally, with each tick of damage, a green area is marked underneath each raid member. Each green area is hit by a projectile a short while after appearing. This deals high Fire damage to any players standing at the impact location. Kilrogg also buffs himself with Death's Door. Death's Door is a stacking buff that increases Kilrogg's damage done with Death Throes by 12%, making each consecutive Death Throes more difficult to survive. Visions of Death is an ability that Kilrogg occasionally uses throughout the fight. He marks a cone-shaped area in front of him with a green visual effect, and places three runes on the ground inside of this area. After a few seconds, one raid member standing in each rune is killed (reduced to 0 health, but without actually dying or losing any buffs) and teleported to a special Death Realm (which we explain further below). If a rune is unoccupied by any raid member, the entire raid takes lethal Fire damage. Throughout the fight, adds will spawn in waves, roughly every 45 seconds. Each add wave is comprised of 2-3 Salivating Bloodthirsters (depending on raid size) and 1 Hulking Terror. Salivating Bloodthirsters are adds with relatively low health They spawn in the general encounter area, and their exact spawn locations appear to be random, although they seem to have a preference for the back of the room. Salivating Bloodthirsters can not be tanked, but they can be crowd controlled (although not stunned). They have no abilities, and as soon as they spawn, they immediately move towards a green pool located on the ground (this is where Kilrogg is standing before you pull him). If they reach it, they become Hulking Terrors. The distance at which the Salivating Bloodthirsters spawn from the blood pool is random. Each time these adds spawn, one of them spawns directly on the blood pool, instantly transforming into a Hulking Terror. This is why, as we mentioned above, there will be one Hulking Terror per add wave (although it is possible for some of the other Bloodthirsters to also turn into Hulking Terrors). Hulking Terrors can be tanked, but not crowd controlled, and have vastly increased health compared to the Salivating Bloodthirsters they spawn from. Savage Strikes is an ability that is frequently used by Hulking Terrors on their current tank. It deals moderate Physical damage to all targets in a 9 yard, 90-degree cone in front of the Hulking Terrors, and applies 2 points of Fel Corruption to all affected players every 0.5 second, for 4 seconds. Fel Claws is a passive ability. It grants the Hulking Terrors' melee attacks a chance to inflict 2 points of Fel Corruption on their current tank. Rending Howl is an interruptible ability that the Hulking Terrors occasionally use. It deals high Physical damage to the entire raid, and applies a 10-second DoT to everyone that deals moderate Physical damage every second. If Rending Howl is interrupted, the Hulking Terrors' casting speed is permanently increased by 75%. This only applies to actual casts made by the Hulking Terrors, and not to their melee attacks. Fel Rupture is an ability that the Hulking Terrors use when they die. It deals heavy Fire damage to all raid members standing in a close radius around the Hulking Terror. Additionally, it launches Fel Spray, which inflicts moderate Fire damage and 30 points of Fel Corruption to the 5 players standing closest to the Hulking Terror. Raid members who stand in the runes created by Kilrogg's Visions of Death ability are teleported to the Death Realm, a small room with 4 doors, from which adds with modest health-pools will continuously spawn at an increasing rate. Whenever an add is killed within the Death Realm, all DPS players inside the Death Realm gain a stack of Undying Resolve, increasing their damage done by 10% per stack for 1 minute. Additionally, healers inside the Death Realm gain a stack of Undying Salvation, increasing their healing done by 10% per stack for 1 minute. This buff stacks up to 20 times, at which point players inside the Death Realm are automatically transported back into the main room. Alternatively, players who die inside the Death Realm are also taken back to the main room. When healers escape from the Death Realm, they gain the Cleansing Aura buff for 1 minute. Cleansing Aura reduces the Fel Corruption of nearby raid members, and this is indicated by a visual effect around the feet of the affected healer. We are not sure by exactly how much the Cleansing Aura reduces Fel Corruption. When killed inside the Death Realm, raid members spawn back into the main room with all of their buffs still intact. Players inside the Death Realm will face the following adds, each with its own ability. Fel Blaze is an interruptible spell with a 10-second cast time. It deals lethal Fire damage to a random raid member inside the Death realm. Fel Flames is an ability used by each Hellblaze Fiend. The Fiend explodes, killing itself and dealing heavy Physical damage to everyone inside the Death Realm. Additionally, it leaves behind a patch of Fel Flames that deals moderate Fire damage to all players standing in it. Cinder Breath is a frontal cone ability that Hellblaze Mistresses regularly use. Fire is unleashed in front of the Mistress, dealing heavy Fire damage to anyone standing in it, and an additional low amount of Fire damage every 2 seconds, for 8 seconds. Your raid has to combine several different elements in order to successfully defeat the Kilrogg Deadeye encounter. We summarise these elements here before going into more details in the following subsections. Your DPS players must ensure that important targets die as quickly as possible. This is mostly the Blood Globules/Fel Blood Globules and the Salivating Bloodthirsters. A few, assigned raid members must step into the Visions of Death runes in order to execute the tasks required in the Death Realm. Tanks are not needed for this assignment. All raid members must always monitor their Fel Corruption level and ensure that they do not reach 100. Both Kilrogg Deadeye himself and the Hulking Terrors must be tanked and require an occasional tank switch. Since Kilrogg's Shred Armor ability can be avoided entirely by his tank using active mitigation to prevent the application of the debuff, no tank switch is needed until that tank has expended all of their active mitigation cooldowns (which should not happen), or until they make a mistake. At this point, we recommend performing a tank switch as soon as the current tank has 1 stack of Shredded Armor. The Hulking Terrors' Savage Strikes has two important consequences for tanks. A tank switch must be performed on the Hulking Terrors when the Fel Corruption of their current tank gets uncomfortably high. This will happen eventually, as the Terrors' Savage Strikes will lead to a steady increase in the tank's Fel Corruption. When the amount of Fel Corruption naturally drops to comfortable levels (due to its decay), or after it has been lowered by a healer affected by Cleansing Aura, the other tank may take over again. Hulking Terrors must be faced away from the raid at all times. This is because Savage Strikes deals damage to everyone in front of the Hulking Terror, and causes affected players to gain Fel Corruption. For positioning on this fight, the default position we recommend is stacking up behind Kilrogg Deadeye. Players targeted by Heart Seeker should go to the opposite side of the boss from where the raid is standing, and run as far away as possible. The tank has to step aside a bit, to avoid also getting hit by the Heart Seeker. The raid can remain stacked up this way throughout most of the fight. The only time when you will have to spread out is when Kilrogg casts Death Throes. When a raid member is targeted by Heart Seeker, they must move far away from Kilrogg to ensure that the resulting Blood Globule/Fel Blood Globule spawns as far away as possible, in order to increase the time it takes to reach Kilrogg. We recommend having an assigned position for Heart Seeker targets to go to. Any position far away from the boss will do, although the back of the room seems like the most logical option, given that Salivating Bloodthirsters will often spawn around there as well. When a Blood Globule/Fel Blood Globule spawns, DPS players must quickly burst them down to prevent them from reaching Kilrogg in time. Additionally, they can use crowd control abilities to slow their movement. When Kilrogg casts Death Throes, all raid members must move as far away from Kilrogg as possible to reduce their damage taken from it. Additionally, they must always be moving in order to avoid the void zones they constantly leave behind, as they explode almost immediately. Salivating Bloodthirsters must be quickly burst down and crowd controlled in order to prevent them from becoming Hulking Terrors. Keep in mind that one Salivating Bloodthirster will always land directly in the blood pool, forcing a Hulking Terror to spawn. When Hulking Terrors cast Rending Howl, this must be interrupted. This can feasibly be done by their current tank. Note that the casting speed of the Hulking Terrors will increase with each successful interrupt, meaning that Rending Howl may become uninterruptible at some point. Despite this increase in casting speed, there is no reason to hold off interrupting the Terrors — none of their other abilities' cast times matter. When Hulking Terrors cast Fel Rupture, all raid members should try to get away from them so as not to gain any Fel Corruption. When assigning DPS players to enter the Death Realm, we recommend prioritising classes and specs with powerful DPS cooldowns, as they can capitalise most efficiently on the damage bonus that they receive. Since Visions of Death will be cast multiple times throughout the fight, you can expect most DPS and healers to have visited the Death Realm at least once during the encounter. 3 players may enter the Death Realm at a time. The players entering the Death Realm should always be 2 DPS players and 1 healer, or possibly 3 DPS players. Their objective within the Death Realm is to stay alive and kill adds until they reach 20 stacks of the Undying Resolve and Undying Salvation buffs, at which point they will be sent back to the main room. Healers inside should not be afraid of using their healing cooldowns, if it means that they can exit the Death Realm with another 10% boost to damage and healing from the players inside. When exiting the Death Realm, DPS players must simply enjoy their increased damage and help the raid with killing the fight's many high-priority targets. Healers exiting the Death Realm will have to strategically place themselves near players with high Fel Corruption. The most popular boss mods include modules that will show these players in a frame, as Fel Corruption cannot be feasibly tracked otherwise. Additionally, players with high Fel Corruption may seek out the buffed healers themselves. The Cleansing Aura's range is clearly marked by a visual effect on the ground, near the feet of the affected healer. Not much can be done to manage Fel Corruption. It will generally be the tank's role to face the Hulking Terrors away from the raid, so that they do not hit raid members with Savage Strikes or with Fel Rupture. Additionally, raid members with high Fel Corruption should aim to stand near the healers with the Cleansing Aura. If a raid member reaches 100 Fel Corruption, they will no longer be of any use to the raid. Instead, they will deal relatively low damage to other raid members. Since the health of a player does not change if they become mind controlled, we recommend simply killing them. We do not yet know if mind controlled players can be tanked or crowd-controlled, nor do we know if resurrecting them will reset their Fel Corruption, or drop their mind control. DPS players should use their Legendary Ring roughly on cooldown, while saving usages for when Heroism/ Bloodlust/ Time Warp is used. Healers should use their Legendary Rings when leaving the Death Realm, to capitalise on the healing bonus from the healer who was sent inside. Tanks should use their Legendary Ring when the Hulking Terrors are live for a particularly long time (which mostly happens when DPS players must prioritise something else). This is primarily also when the tanks' Fel Corruption reaches uncomfortable levels. Kilrogg Deadeye is a reasonably straightforward add-control encounter. By executing the Death Realm phase well, the encounter will be much more approachable, as numerous stacks of damage/healing buffs are applied to players. As with most add-control fights, all adds that spawn take higher priority in terms of DPS than the boss himself. Below, we list the most important points to master in order to succeed at the Kilrogg Deadeye encounter. Interrupt Rending Howl as much as possible, until it is impossible to do so anymore (since the Hulking Terrors' casting speed increases with each successful interrupt). Go as far away from Kilrogg as possible when debuffed with Heart Seeker. A single yard can mean the difference between a kill or a wipe. Minimise damage taken from Death Throes by constantly moving when it is being cast, and staying as far away from Kilrogg as possible. The Mythic mode of the Kilrogg Deadeye encounter is similar in execution and underlying mechanics to the Normal/Heroic version of the encounter, but there are several changes to the fight that make it much more challenging. Aside from all mobs having more health and dealing more damage, the Mythic version of this encounter brings changes to a number of abilities. There are two changes to the Heart Seeker ability. The DoT Heart Seeker applies applies now lasts until the end of the fight. About half-way through the fight, Kilrogg begins casting Heart Seeker on two players each time instead of only one. It is worth noting that the DoT applied by Heart Seeker can be dispelled by Paladins' Hand of Protection. There is a change to Death Throes, which now causes all raid members to gain 1 Fel Corruption with each tick, while raid members who are hit by one of the projectiles created by Death Throes receive 5 Fel Corruption. The Hulking Terror adds now apply 40 Fel Corruption to their tank with each cast of Fel Rupture, up from 30, and they have a new ability. Whenever they cast Fel Rupture, as well as when they die, the Hulking Terrors leave behind a Fel Puddle void zone. These void zones do not deal any damage, but instead they apply 6 Fel Corruption per second to anyone standing in them. They only disappear when all of their Fel Corruption has been absorbed (each Fel Puddle seems to hold about 90 Fel Corruption). Simply leaving Fel Puddles up is not viable, though, because each time Death Throes is cast, a Fel Blood Globule will spawn from each Fel Puddle still up at that time. Finally, each wave of Salivating Bloodthirsters now contains 4 adds, up for 3 (or 2, depending on raid size) in Normal/Heroic mode. Despite the high number of changes, the strategy for the Kilrogg Deadeye encounter does not change significantly on Mythic mode. Add control remains the single most important aspect of the encounter. Your raid will have to handle the Fel Blood Globules, but this is not very complicated. Essentially, anyone targeted by Heart Seeker should be as far away as possible from Kilrogg, and these adds should be killed with a very high priority, before they have a chance to reach the boss. The next thing your raid must take special measures to handle are the Fel Puddle void zones created by the Hulking Terrors. These must all be soaked before Death Throes is cast, so that no additional Fel Blood Globules spawn from them. You will have to have several raid members with low-moderate levels of Fel Corruption soaking them until they disappear. It is also worth noting there that it is important not to kill a Hulking Terror shortly before a Death Throes cast, as this can leave you with insufficient time to despawn the resulting Fel Puddle (which will then spawn a Fel Blood Globule when Death Throes is cast). When Kilrogg casts Visions of Death, we recommend sending DPS with strong AoE capabilities into the Death Realm. The tuning in the Death Realm is significantly tighter, which necessitates high AoE damage to survive long enough to get the 20-stack limit. Enhancement Shamans, Frost Death Knights, Balance Druids, and Destruction Warlocks are particularly good, but any class with high AoE damage is acceptable. The DoT applied by Heart Seeker must simply be healed through, but it is important to make as much use as possible of your Hand of Protections to remove some of these DoTs. For positioning, we recommend having the raid stand in either side of the room, while remaining fairly close to Kilrogg's starting position. The boss should be tanked on the other side of the room, but still in the side of the room that is closest to his starting position. From here, raid members targeted by Heart Seeker should move as far away from Kilrogg as possible. When Death Throes is cast, ranged raid members should move for the duration of the cast, in order to make it easier to avoid the projectiles caused by Death Throes. Finally, there is not much your raid can do to mitigate the increased Fel Corruption gains in Mythic mode (from abilities like Death Throes and Fel Rupture, but good use of Cleansing Aura will be very important. In this section, you will find the loot table for Kilrogg Deadeye. The section is divided in 3 subsections: armor, weapons, and the rest (neck, back, finger, and trinket items). This concludes our raid guide for Kilrogg Deadeye. We hope you have found it helpful. Please do not hesitate to post any feedback you may have on our forums. 28 Jul. 2015: Clarified an issue regarding Fel Blood Globules, namely that they actually exist in Normal/Heroic mode. 14 Jul. 2015: Added Mythic mode strategy. 05 Jul. 2015: Added link to LFR guide. 25 Jun. 2015: Clarified a few aspects after experiencing the fighton live realms. Fel Blood Globules spawn when players with Fel Corruption are hit by Heart Seeker. 3 players may enter the Death Realm, and players inside the Death Realm can attain a maximum of 20 stacks of the buffs gained inside, before being teleported back to the main room.